Today we have Football perm that will return around £100 for A £7 stake if successful. A racing selection that runs on the telly this afternoon and details of two bookie offers that will increase your returns today. Before I get onto all that I just want to give you another chance to get the selections from the systems we gave away this week. Somehow I managed to make a boo boo with the link for this offer and it wasn't working for a lot of readers. To recap, the All Weather system makes a whopping 125% ROI and the National Hunt system makes a very respectable 117% ROI. You can have all the selections from these two systems mailed to you the night before racing for just £12.95. When you go to this page scroll down to the Daily Punt special offer & ignore the bit that says it's only valid for Friday (as I've had the offer extended due to my link mistake). The best overall odds* for the ‘Best 6 Homes' are available with Coral. If you bet a pound on each accumulator for a total stake of £7 the return if all win will be around £100 depending on which bookie you bet with. (I've placed it with Bet 365 and the return shows as £98.63. To the horse racing, there are two offers you might want to use with this selection. 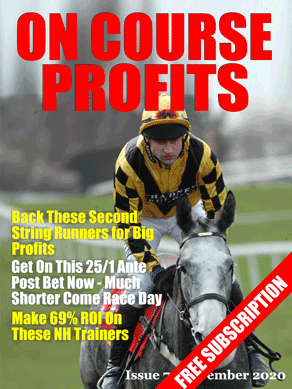 The Betting Insiders report has just landed on my doormat. I read it cover to cover as soon as it lands. The piece that caught my eye, especially as I'm thinking about my Premier League bets for the weekend, is regarding home advantage. Leon Pidgeon has done some detailed research on whether home advantage exists. And more specifically, how much should it effect the selections we bet on. Leon goes on to analyse individual leagues both in the UK and all over Europe to see where home advantage is a factor and where it is not. It wouldn't be fair for me to share the stats publicly. After all Leon has put in hours of work and club members have paid for this research via their subs. But the point I want to make is that this research goes against one of my rules of football betting. That is that the home, away, draw football markets are tight and that my profit needs to come from the side markets where I can be more expert. Than the experts. What this home advantage research shows me is that we can get ahead of the bookies in the lower leagues. It makes sense that odds makers will be looser in these markets where not so much is bet. In every league the percentage of home wins is higher than aways or draws. As you would expect. This research doesn't mean that I'm going to be blindly backing homes or aways in the relevant leagues, but rather that I will factor this into my footie bets. And it might herald a move back into the match odds market. Which I currently only use for trading.